According to a recent report written by the Sportsmen’s Alliance based out of Ohio titled “Court Sides with Sportsmen on Key Issue, but Leaves Wolves Protected for Now” extreme animal rights activists groups like HSUS were forced to accept defeat in court paving the way for true wolf recovery that will benefit sportsmen. On Tuesday, Aug. 1, the U.S. Circuit Court of Appeals for the D.C. Circuit issued its ruling in the Western Great Lakes wolf lawsuit appeal. The ruling is a short-term setback, but very likely a win for sportsmen in the long run. For the immediate future, the Appellate Court’s decision leaves Endangered Species Act listing in place, upholding the lower court’s 2014 ruling that the U.S. Fish and Wildlife Service (FWS) erred in delisting wolves in 2011. Very importantly, however, the court laid out a road map for FWS to delist the Western Great Lakes wolves on remand and dismantled many of the dangerous and unsupported holdings in the lower court decision. “The central dispute in this case is whether the Endangered Species Act permits the Service to carve out of an already-listed species a “distinct population segment” for the purpose of delisting that segment and withdrawing it from the Act’s aegis. We hold that the Act permits such a designation, but only when the Service first makes the proper findings.” (Op. at 15-16). This ruling means that, if the Fish and Wildlife Service takes the right steps, they are able to delist a recovered species in some places (a distinct population) without having to delist it everywhere. This flexibility will make the ESA more efficient and possibly subject to fewer legal challenges. HSUS and their partners had argued that FWS could never delist a smaller portion of a species unless the entire species had fully recovered and could be removed from the Endangered Species Act protections. HSUS has now lost that point. “The court’s ruling that regional delisting is legally possible is a victory for sound scientific wildlife management and further upholds DPS policy of the Endangered Species Act as an important tool for conservation moving forward,” said Evan Heusinkveld, president and CEO of the Sportsmen’s Alliance. “While we clearly would have preferred that wolves be returned to state management today, this ruling provides a path forward for the Fish and Wildlife Service on how to successfully delist wolves once and for all. •The court upheld FWS’s interpretation that the ESA’s definition of “range” refers to “current range” at the time of the listing or delisting decision that is the subject of the case, not “historic range,” as HSUS argued. HSUS’ interpretation would mean that populations may never be delisted if they could not rebound throughout their historic range. However, the court said FWS must consider large losses in historical range in evaluating the continuing viability of the species in its current range. On remand, FWS must decide the “baseline” date from which historical range loss is measured. One likely date could be 1973 – the year Congress enacted the ESA. 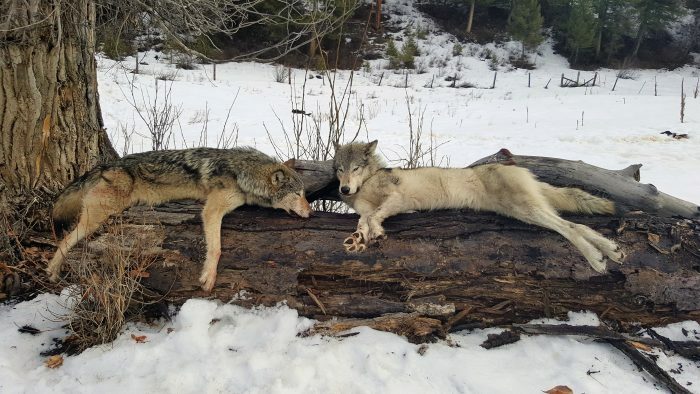 •HSUS argued that FWS failed to explain why the wolf population’s combined mortality from humans and disease is not a continuing threat to the species’ existence. The court found that FWS had thoroughly examined these factors, and that the wolf population had continued to grow despite any disease or human-caused mortality. •HSUS attempted to characterize Minnesota as an “unregulated killing zone.” While the lower court decision had agreed, the Circuit Court disagreed and found that Minnesota’s depredation plan did not amount to an “unregulated killing zone,” as it was indeed regulated and unlikely to threaten wolves’ survival. •HSUS argued the lack of state regulatory plans to monitor and protect the Western Great Lake wolves outside of their core recovery areas in Minnesota, Wisconsin, and Michigan did not support FWS’s decision to delist those wolves. The court found that the lack of separate state plans in six nearby states was not a concern because wolves are virtually non-existent in those states, and those animals that do occasionally appear there are protected by other measures or they do not significantly contribute to the WGL population. •HSUS challenged the 2011 rule on genetics issues concerning whether there are one or two wolf species. The court rejected the HSUS argument that there were two separate species of wolves, and thereby additional protections were warranted. •HSUS argued that FWS had inappropriately responded to political pressure from Sen. Amy Klobuchar (D, Minnesota) in adopting its wolf-delisting order. The court rejected that argument, stating that HSUS could point to no science “ignored, misused, or manipulated” or to any material change in FWS’ position in response to a letter from Sen. Klobuchar. In particular, the court cites that FWS had acted favorably in response to several delisting petitions (including the Sportsmen’s Alliance petition) before Sen. Klobuchar’s letter. The case stems from a late 2014 decision by U.S. District Court Judge Beryl A. Howell that ruled the U.S. Fish and Wildlife Service had to return wolves found in the western Great Lakes area to the protections afforded by the Endangered Species Act. At the crux of the case was the delisting of a “distinct population segment” of wolves from the Endangered Species Act. The lawsuit brought by Humane Society of the United States; Born Free, USA; Help Our Wolves Live; and Friends of Animals and Their Environment argued that despite a healthy population of wolves that had surpassed all recovery goals in the western Great Lakes region, since wolf populations haven’t recovered in all 50 states, the animals must remain under federal protection as an endangered species even where they have recovered. Joining the Sportsmen’s Alliance Foundation in this case, was the Rocky Mountain Elk Foundation, Safari Club International, the Wisconsin Bear Hunters Association, the National Rifle Association, Michigan United Conservation Clubs, Wisconsin Bowhunters Association, Upper Peninsula Bear Houndsmen Association and Michigan Hunting Dog Federation. About the Sportsmen’s Alliance: The Sportsmen’s Alliance protects and defends America’s wildlife conservation programs and the pursuits – hunting, fishing and trapping – that generate the money to pay for them. Sportsmen’s Alliance Foundation is responsible for public education, legal defense and research. Its mission is accomplished through several distinct programs coordinated to provide the most complete defense possible.